Pandora has launched a new, tablet-optimized Android app for its Internet radio and music recommendation service in the US, Australia and New Zealand today. The experience has been designed from the ground up to take advantage of the added screen real estate offered by these larger devices. 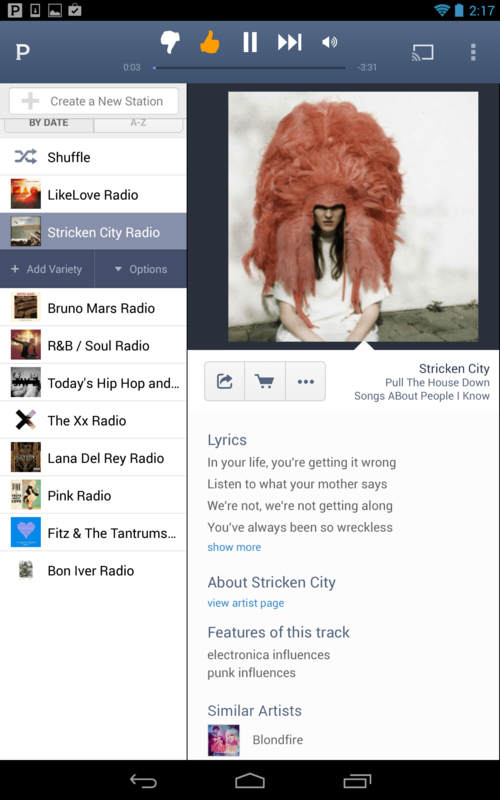 Pandora is also offering design and feature parity with it’s existing Android and iOS apps, thereby ensuring that these new tablet users never feel like second-class citizens. Listeners can dive into the refined ‘Now Playing’ screen to purchase the current track directly through Amazon, or access a profile page for the artist which includes their biography, discography and lyrics. Users also retain a personalized profile and music feed, which stores custom radio stations and bookmarked tracks. Pandora says it’s also tweaked the user interface to simplify social sharing; listeners can either public their recent tracks on Facebook with the Pandora Timeline app, or manually post links to specific stations on Twitter.